Display your device's location using Spot'it, a geolocation feature, and Ubidots. Sigfox was created in 2010 and is a recognized global pioneer and leader in the device connectivity sector that is already disrupting business models. The ambition of Sigfox, embodied in the slogan "Make Things Come Alive," is to give a voice to the physical world around us and to allow these millions and one day billions of objects to play a role in economic and social development. One way that Sigfox is setting itself apart as a is with its geolocation services called Spot'it - a very low cost mechanism to track a large of assets around the world, without needing GPS. Spot'it is a new asset tracking service that allows any Sigfox modules to become a geolocation service, without need to upgrade the hardware of software. Spot'it doesn't require hardware or additional updates, and the device doesn't have to transmit more messages, which means that there is no impact on the operating cost for consumer's solution. Spot'it doesn't use GPS technology (which consume a lot of energy), nor does it require any additional processing or energy consumption than a standard Sigfox device currently utelizes. Spot'it represents the first geolocation service for devices connected to IoT worldwide. This simplifies the global management of the supply chain: once a device is registered in the Sigfox Cloud, the geolocation system will be available in all territories that the network is present. Unlike the traditional GPS system, Sigfox Spot'it works both indoors and outdoors. NOTE: To learn more information about Sigfox's Geolocations, reference this Sigfox press release on Spot'it. Using this guide you will learn how to setup your Sigfox service callback to send the location of your device to the Ubidots cloud to display and locate your asset in real-time. 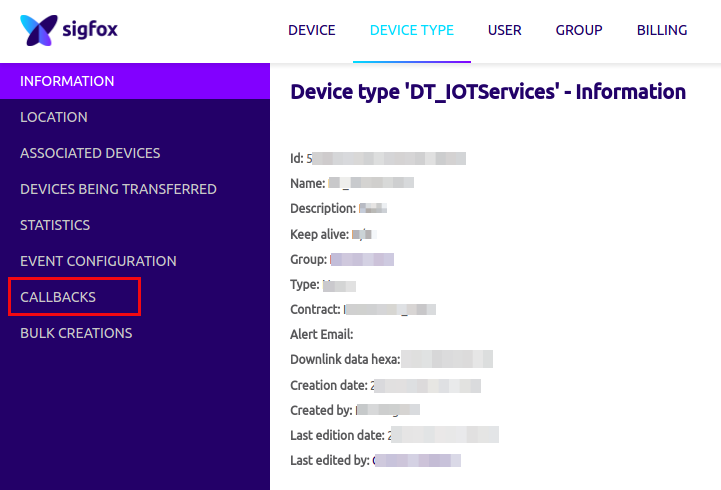 IMPORTANT NOTE: this guide assumes that the device is already registered and is already sending data to the Sigfox backend. If your device is not yet configured, reference to these articles below to complete your device setup. Sigfox callbacks allow you to report data to an external system like Ubidots. 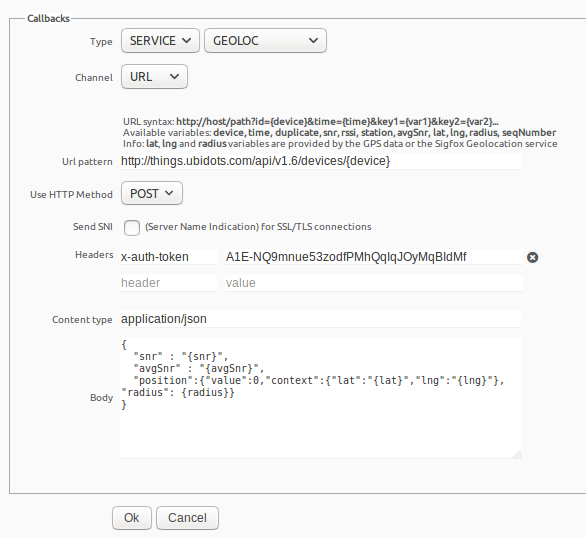 In this case we are going to configure the geolocation service to the callback to send the position of the device to Ubidots. NOTE: If you don't how find your Ubidots TOKEN, please reference the article below. 4.- Once you have confirmed the callback as accurate, press "OK". Your callback is now ready and enabled to post data to the Ubidots Cloud. Now that the service callback is configured, and your device is sending data to the Sigfox backend, it will automatically create a new device in your Ubidots account with the ID of your Sigfox device as the "name." If you look inside the device you will see the variables sent, and inside the "position" variable you will see the coordinates of the device in the context. As you can see in the image above and your own dashboard, the position of the device has automatically been assigned. Pro application - Create a Map Widget. Ubidots helps tracking your devices using the Maps Widgets. To learn more about maps and how to create your own applications, check out Ubidots Help Center for additional resources and instructions. Thanks to the Service Callback from Sigfox we can implement a low cost and low power consumption application that is supported almost in all the world, no matter if the device is indoors or out! Now it is time to create a dashboard and control/manage the variables of your Sigfox device. To learn more about Ubidots widgets and events, check out these video tutorials.